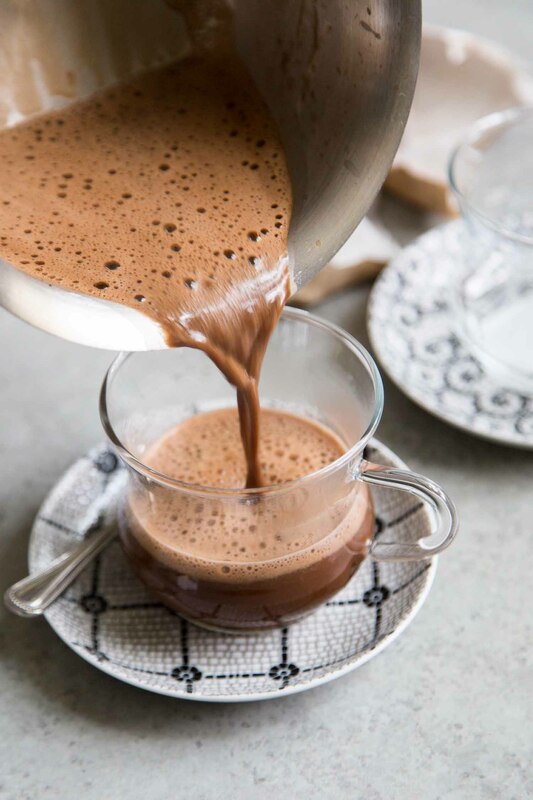 Tsokolate is a Filipino version of hot chocolate typically served during breakfast with bread. Chocolate for breakfast is not uncommon in the Philippines. The only question is: would you like your chocolate with rice, or do you prefer to drink your chocolate? If you picked rice- hop on over to this champorado recipe (Filipino chocolate rice porridge). 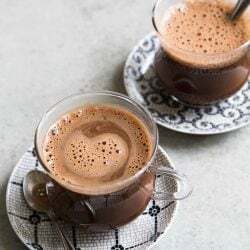 If you answered chocolate in liquid form, let me offer you a cup of tsokolate (Filipino hot chocolate). 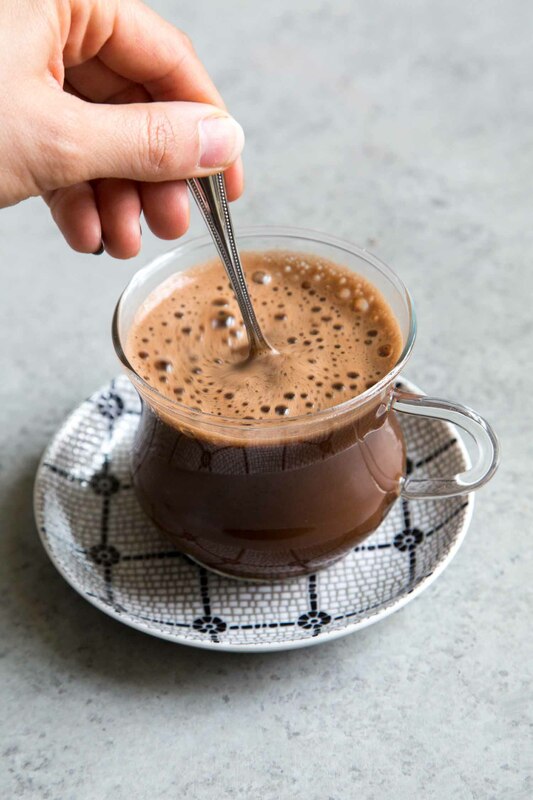 Tsokolate, pronouced Cho-Ko-Lat-Eh, is a simple beverage made by dissolving cacao tablets in hot water. It is lightly sweetened with sugar and sometimes served with a splash of milk (or cream). The hot chocolate mixture is traditionally mixed together using a batidor. It is a whisk-like baton that helps to froth the liquid. Since I don’t have a batidor, I use an immersion blender to achieve that same consistency. In the morning, tsokolate is often served with breads (usually pan de sal). As a kid, I’d often dip and soak my buttered pan de sal into the hot mug of tsokolate. I’m getting hungry just thinking about the thick liquid chocolate coating the salted buttered piece of bread. Tsokolate is very popular during the holiday season. You are bound to find a pot of freshly brewed tsokolate after Christmas Eve mass (simbang gabi) and it will definitely be available during Christmas morning. What are cacao tablets (tablea cacao)? Where can I purchase them? 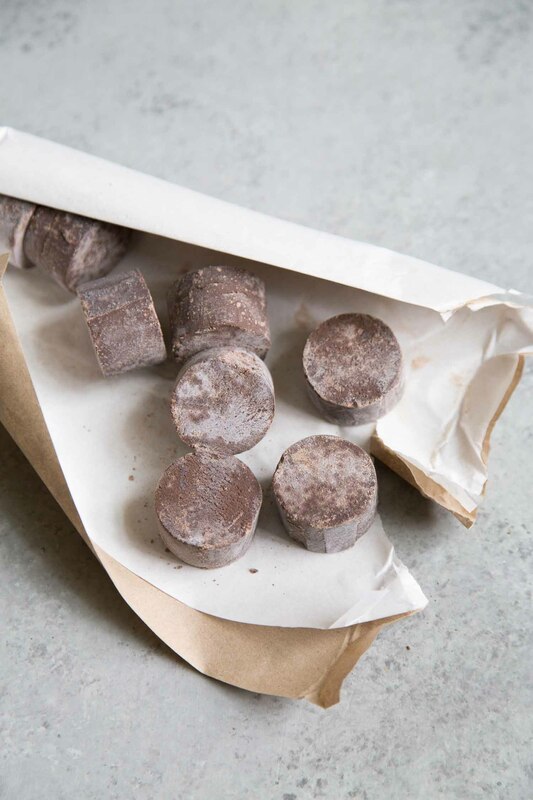 Cacao chocolate tablets are made from pure cacao beans that have been fermented, roasted, ground, and molded into round disks. Pure tablets are unsweetened. These can be a bit difficult to find. The most common cacao tablets sold at Filipino supermarkets are the sweetened version. While there are various brands to choose from, I am partial to Antonio Pueo. That’s the brand I’ve been using since childhood. I use the sweetened version which is simply made with cacao and sugar. That’s it! This Antonio Pueo version is sold in either a tan or gold wrapper. It is sold as a log of eight tablets. This one is my favorite! 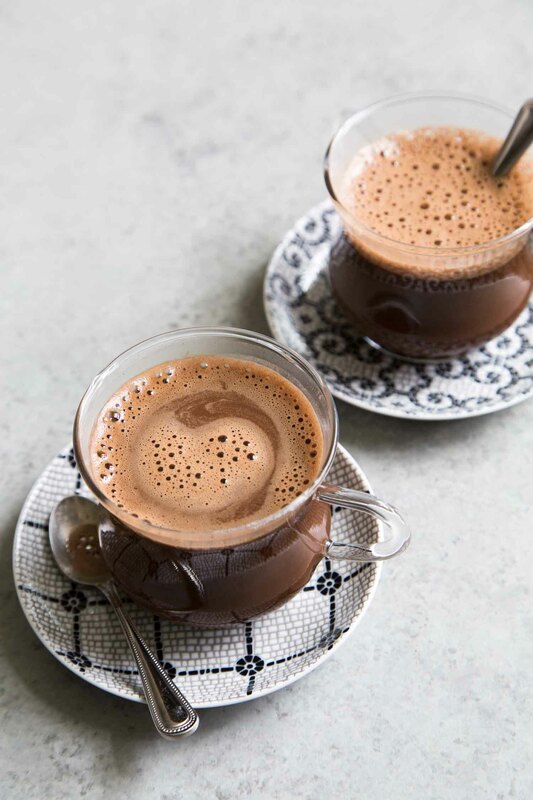 However, if you like your hot chocolate with milk, Anontio Pueo also sells a variety that contains cacao, sugar, and powdered skim milk. This one is sold in a white wrapper. Cacao tablets are available at Filipino supermarkets (like Seafood City and Island Pacific). Look in the baking aisle, alongside the sugar. Many Asian and Latin markets also carry cacao tablet variations. What is that white stuff on the chocolate? Is that mold on the cacao tablets? Do not be alarmed if the cacao tablets have powered white spots, like the one photographed above. THIS IS NOT MOLD. That white coating on the chocolate is “bloom.” Chocolate may bloom due to changes in storage temperature or humidity. This will not affect the taste of the hot chocolate. This traditional hot beverage is normally served during breakfast alongside bread (like pandesal or ensaimada). Bring water to a boil. Add cacao tablets and stir to combine. Reduce to a simmer and continue to stir until tablets have dissolved. Remove from heat and use an immersion blender to froth mixture. Pour into serving mug and enjoy warm. If desired, add a splash of milk, evaporated milk, or cream. There are various kinds of cacao tablets available. They are usually sold as a roll of tablets. For this recipe, I used Antonio Pueo tablets. It has two ingredients: cacao and sugar. This version is sold in either a tan or gold wrapper. This is the one I grew up drinking. Antonio Pueo also sells a version that is a mixture of cacao, sugar, and powdered skim milk. This version is sold in a white wrapper. You can also find unsweetened pure cacao tablets. Unsweetened hot chocolate will be very bitter. Add sweetener and milk to your liking. Do not be alarmed if the cacao tablets have powdered white spots. These are not molds. That white coating is "bloom." Chocolate may bloom due to changes in storage temperature. This will not affect the taste of the hot chocolate. WHERE TO FIND: Cacao tablets can be found at Filipino markets, as well as Asian and Latin markets. If you cannot find any cacao tablets, a mixture of Dutch processed unsweetened cocoa powder is a good substitute. Yummy! I love hot chocolate and I am definitely going to try your intriguing recipe, MaryAnne! A perfect treat which has the potential of becoming my favorite dessert! Thank you! I agree, I could drink this every morning! Hi Im so excoted to check your blog. But dor now when you introduced I feel Im gonna like your blog. We have the same attitude when it comws ro cook and love ro feed people 😊. More powers and Godspeed.